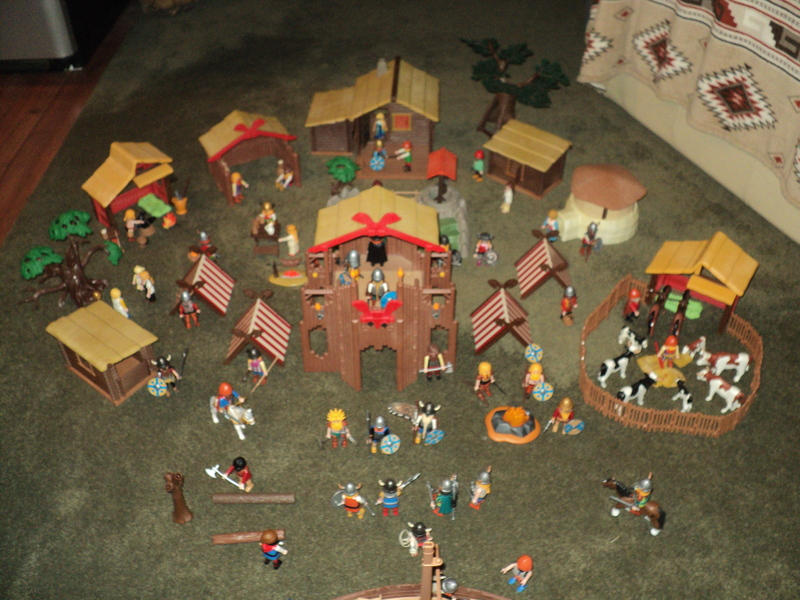 Here is my custom Playmobil Village with a Tower & Barracks, 4 Warriors Tents, 3 small Timber houses, 1 large Timber house, 1 Dark Age Hut, 1 Blacksmith’s Workshop, 1 Stable & Corral, and 1 Storehouse. Plus a small farm with a Well. 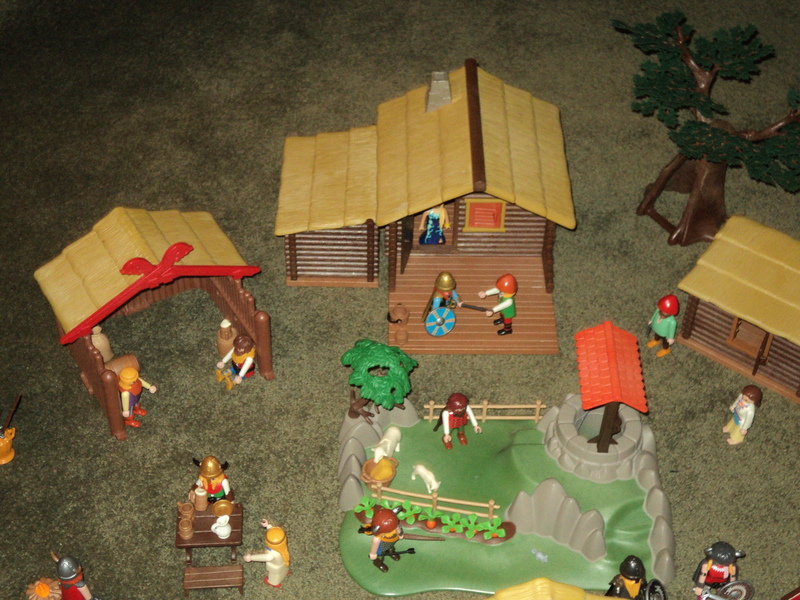 Left side of Village has 1 small Timber house, a Blacksmith’s Workshop, and a Storehouse. Plus 2 Warrior’s Tents. 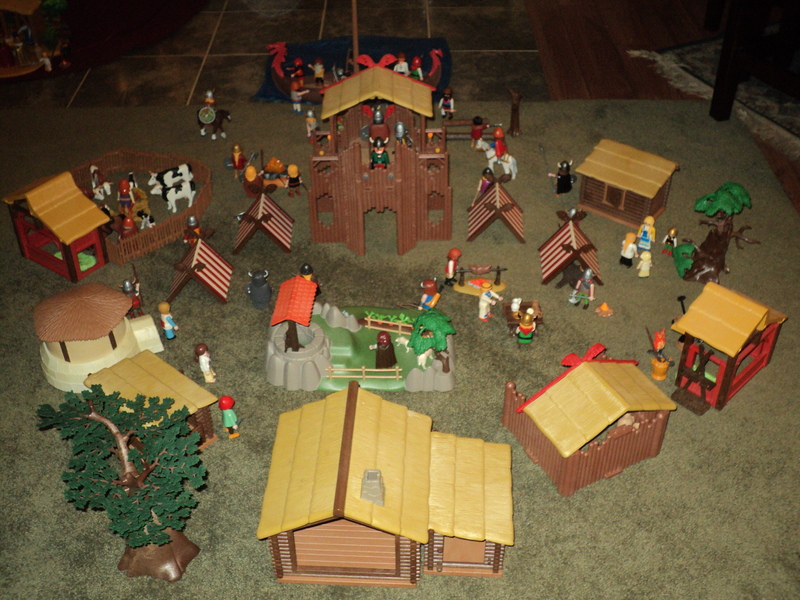 In the rear center of the Village is large Timber house, a small Timber house, and a small farm with a well. Towards the right rear of the Village is a small Timber house, a Dark Age Hut. Large Timber house with a small Timber house connected. 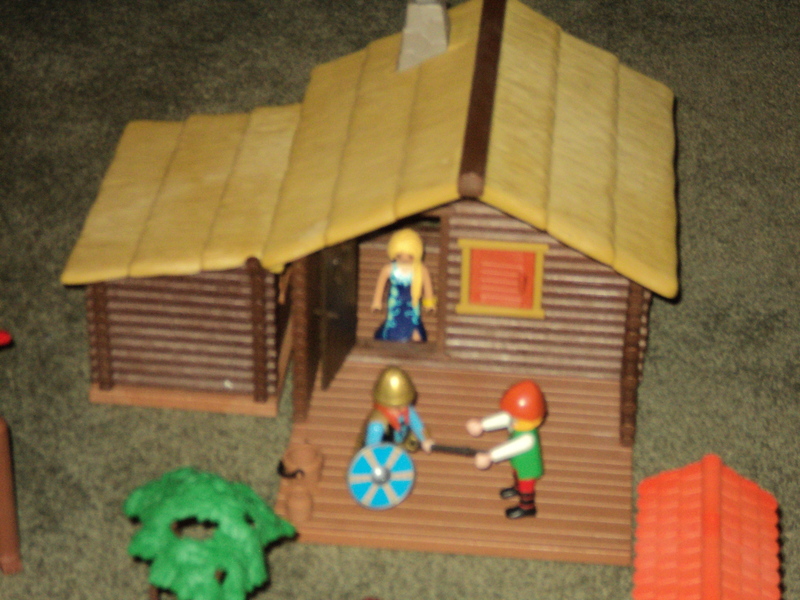 Rear shot of the Viking Village. Small Timber house and 2 Warriors Tents. 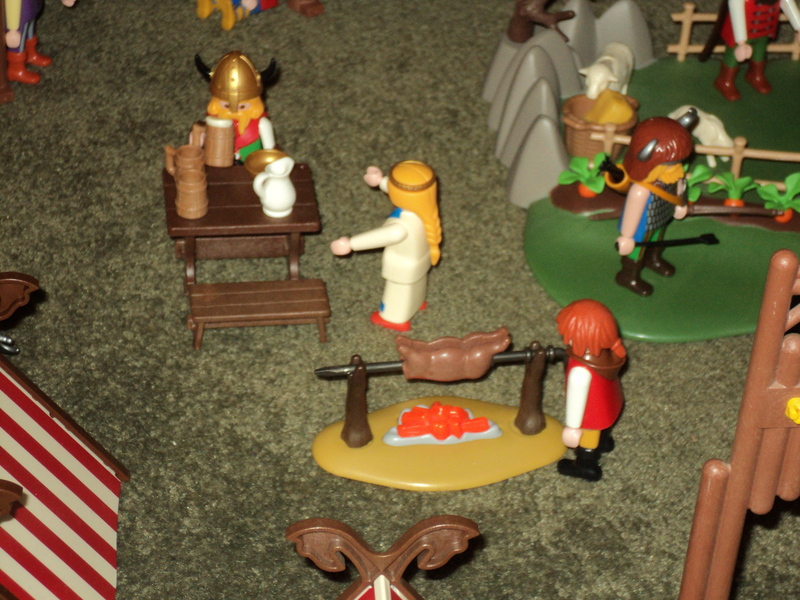 Vikings drinking mead and roasting a pig. Closeup view of the Watch Tower. Close up view of the leaders of the Village. 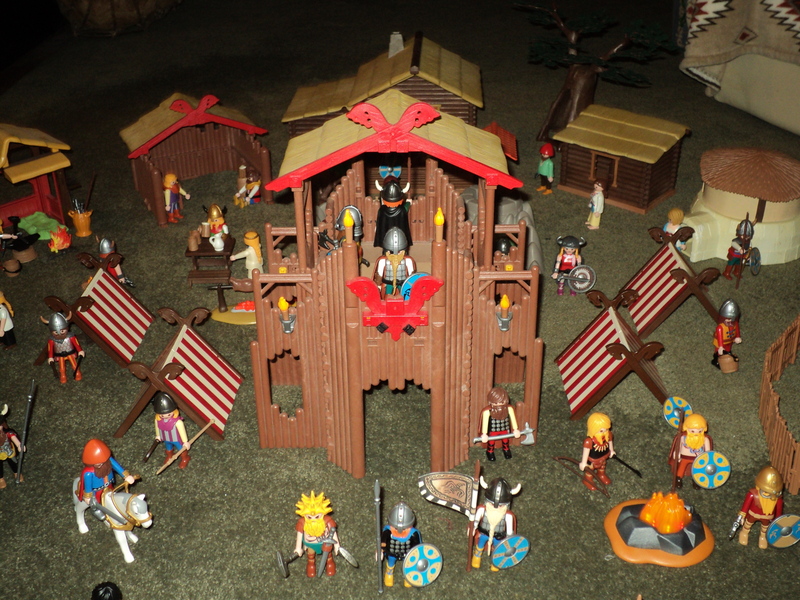 Here is a set up of most of my houses that I use for my Playmobil Viking Village. 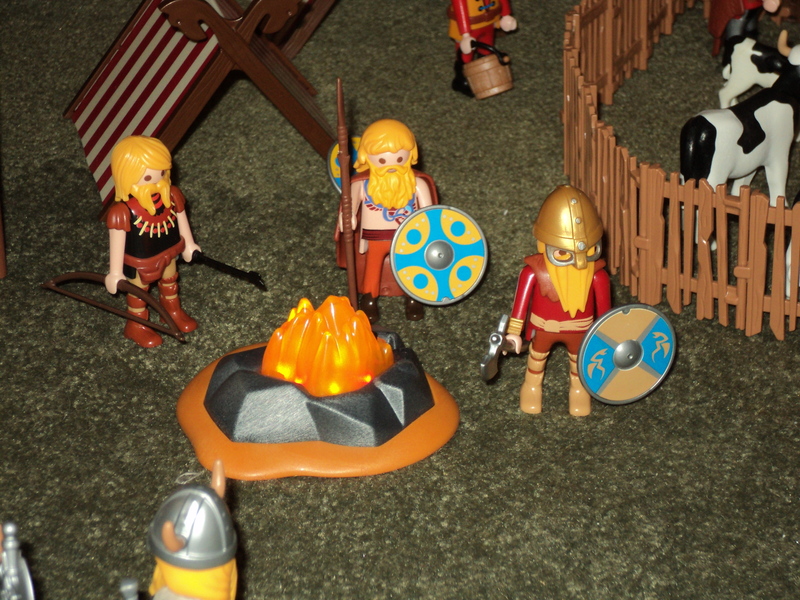 About a quarter of the Vikings I have are here, most are warriors. 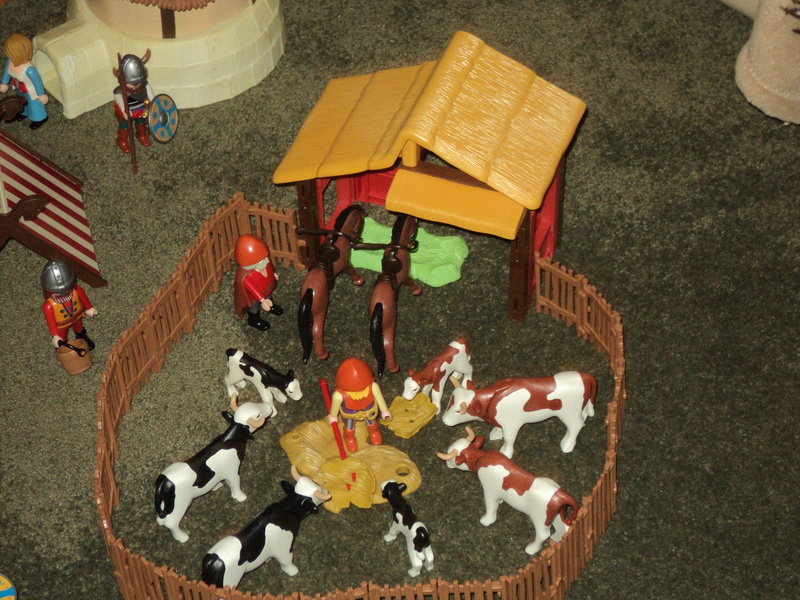 I included 3 small Timber houses, 1 large Timber house as the main house, 1 Dark Age Hut, a Blacksmith’s Workshop, a Storehouse, a Stable & Corral, a small farm with holding pen and well, 4 Warrior’s Tents and lastly a Watchtower and it also includes a Troop Barrack. Thanks for reading and viewing the pictures. 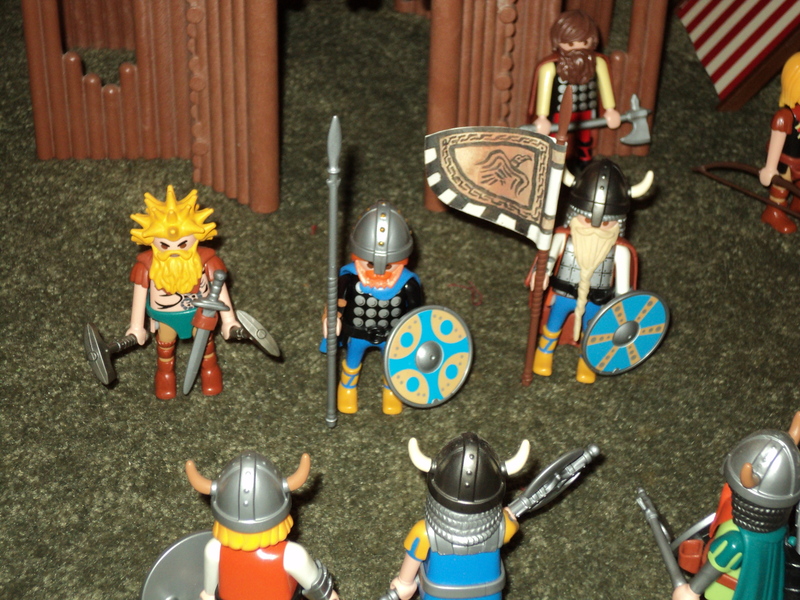 Hier ist eine Einrichtung der meisten meiner Häuser, die ich für meine Playmobil Wikingerdorf. Etwa ein Viertel der Wikinger ich sind hier, die meisten sind Krieger. I enthalten 3 kleine Holzhäuser, 1 großes Holzhaus wie das Haupthaus, 1 Dark Age Hütte, eine Schmiede, ein Lagerhaus, ein Stall und Koppel, ein kleiner Bauernhof mit Stift und gut, 4 Krieger-Zelte und schließlich ein Wachtturm und es enthält auch eine Truppe Barrack. Danke fürs Lesen und Betrachten der Bilder. 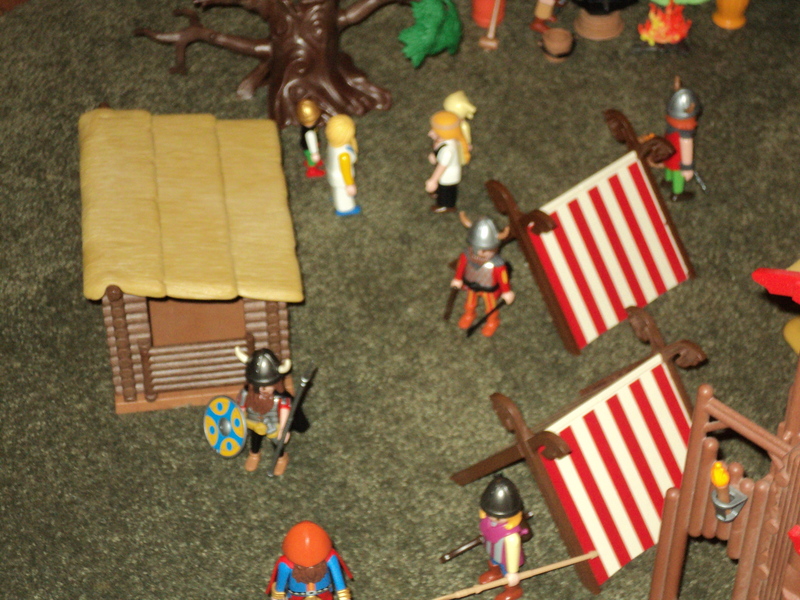 Voici une mise en place de la plupart de mes maisons que je utilise pour mon Playmobil Viking Village. Environ un quart des Vikings je ai êtes ici, la plupart sont des guerriers. 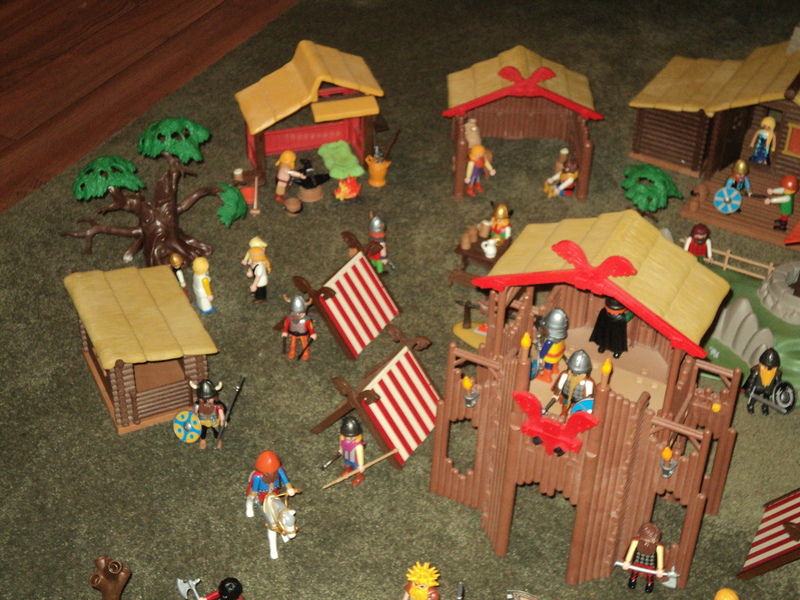 Je ai inclus trois petites maisons en bois, une grande maison de bois que la maison principale, une Dark Age Hut, atelier d’un forgeron, un entrepôt, une écurie et Corral, une petite ferme avec un stylo tenant et bien, 4 tentes de guerrier et enfin une tour de guet et il comprend également une troupe Barrack. Merci pour la lecture et la visualisation des images. 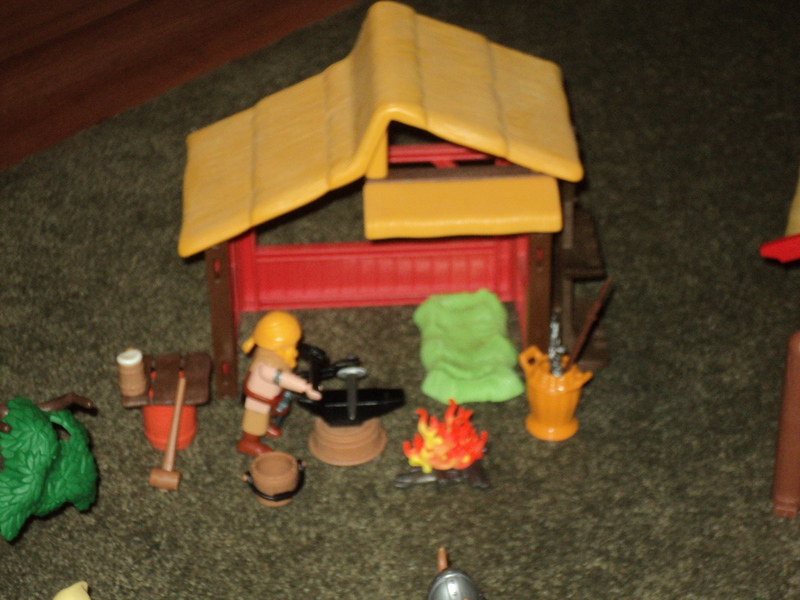 Aquí es un conjunto de más de mis casas que utilizo para mi Playmobil Viking Village. Aproximadamente un cuarto de los vikingos que tengo aquí, la mayoría son guerreros. Incluí 3 pequeñas casas de madera, 1 gran casa de madera como la casa principal, 1 Dark Age Hut, el taller de un herrero, un almacén, un establo y corral, una pequeña granja con que sostiene la pluma y bueno, 4 tiendas de campaña de Guerrero y, por último, una torre de vigilancia y también incluye una tropa del cuartel. Gracias por leer y ver las imágenes. Great job. 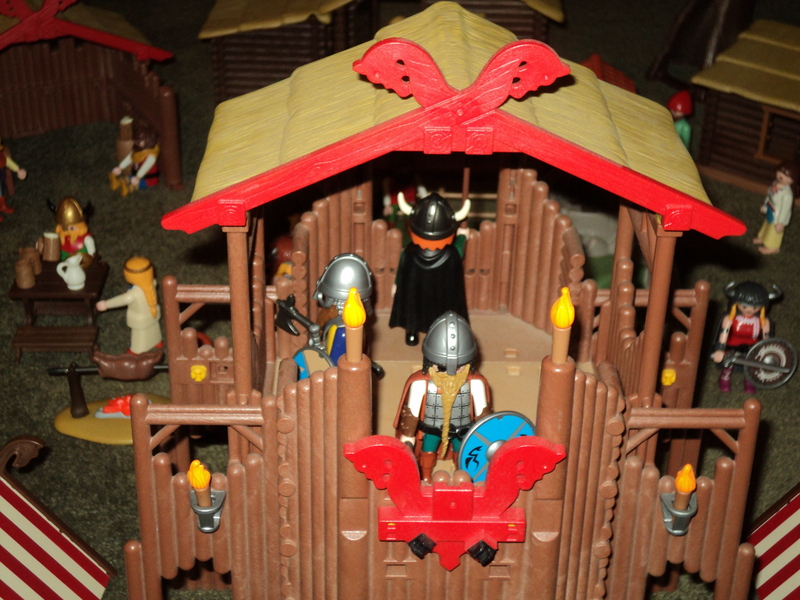 We also love the viking theme and Playmobil. 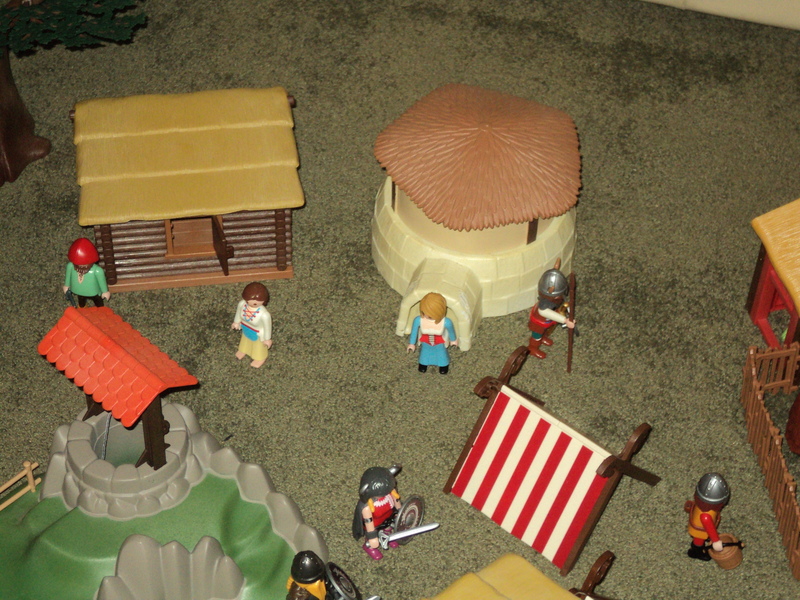 Visit us at http://madonplaymobil.blogspot.com.es/. We love these lovely beards. Where did you find them? 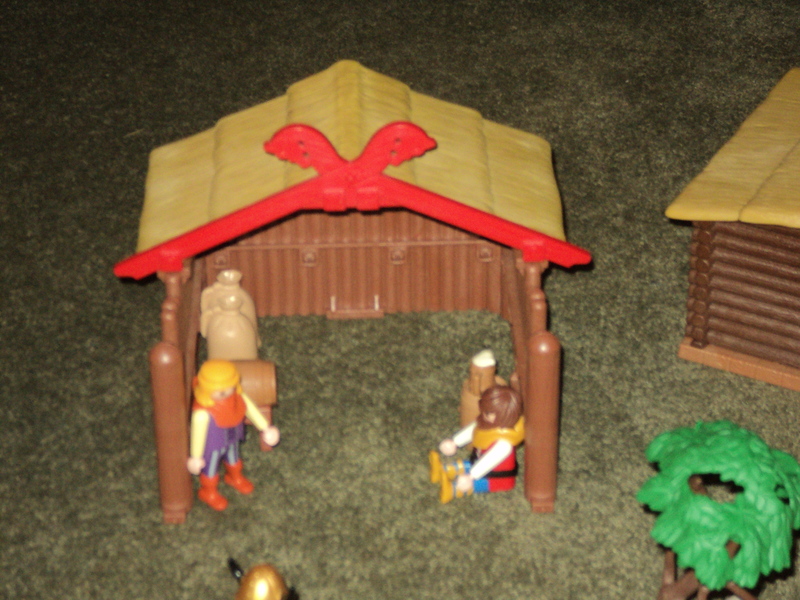 Are Playmobil or custom made. Thanks and congratulations. Hi again, was looking through you site and it is Great!!! Was trying to figure out how I can post a comment, got to figure that out was trying to translate that. Can’t wait to see those 2 new buildings. The beard is custom made by me. Used epoxy to mold some, others I crafted and then added to existing beards. Plus painted. I will check out you page, Thanks again.